On my first day in Kathmandu I had a flashback to when I was 19 years old and was out of the country for the first time. It was one of those days that I wanted to capture, to hold on to, and to stare into it like a snow globe. I was completely bewildered, confused, and with my senses overwhelmed, but loving every second. This country was already so completely different from anything I have ever experienced, and it was just day one. Nepal is a small landlocked country in south Asia between China (Tibet) in the north and India in the east, south, and west. It is known for its beautiful scenery, culture, and people. It is the birthplace of Buddha and the home of Mount Everest, the tallest mountain in the world. Adventures lovers and non-trekkers both are equally fond of the Himalayas and its culture, architecture, temples, shrines, glorious history, people, lakes, rivers, jungles, and much more. There is something about a trek in the Himalaya that is addictive and brings people back again and again. Nepal has a population of about 30 million and is a mix of Hindu, Buddhist, animist religion, with some Muslims and Christians also. It is a fascinating mosaic of cultures, ethnic groups, and languages. It is amazing that in a country of this size that there are over 125 different ethnic groups and more than 123 spoken languages! On May 28, 2008, the constituent assembly voted in overwhelming favor of abolishing the monarchy in Nepal and declared it as the democratic republic of Nepal. This historic development followed a cease fire agreement between the government and the Maoists signed in November 2006, putting an end to 10 years of instability and violence in the country. The announcement of the abolishment of the monarchy also brought and end to 240 years of Royal rule in the country. Today the general feeling among Nepalese is a positive one and many believe that Nepal is now finally moving forward with a new identity as a democratic country. The country is also recovering from a 7.8 earthquake in 2015 that killed 9000 people and injured 22000. Nepalese people are very welcoming of tourists and travelers and now is a great time to visit! My first day in Nepal was a full one of seeing the sights in Kathmandu valley including Durbar Square, Monkey temple, Pashupatinath temple, and Boudhanath stupa. Kathmandu Durbar Square in front of the old royal palace of the former Kathmandu kingdom is one of three Durbar (royal palace) squares in the Kathmandu valley in Nepal, all of which are UNESCO World Heritage Sites. Several buildings in the square collapsed due to the major earthquake on April 25, 2015. Many of the famous structures here that I had seen in the guidebooks prior to my visit were under reconstruction. I found it interesting that they do not “retrofit” these structures. They reconstruct all with the original design and materials. I was lucky enough to see the Kumari, or Living Goddess, make an appearance! Nepal has the tradition of worshipping young pre-pubescent girls as manifestations of the divine female energy or devi in Hindu religious traditions. She lives in the Kumari Ghar, a palace in the center of the city. We were not allowed to take pictures of her, so the below photo of her is from welcomenepal.com. Wooden beams holding up the walls of the living goddess’s palace?! Swayambhunath is an ancient religious architecture atop a hill in the Kathmandu Valley, west of Kathmandu city. The Tibetan name for the site means “sublime trees” for the many varieties of trees found on the hill. Swayambhunath is also known as the Monkey Temple as there are holy monkeys living in the north west parts of the temple. They are holy because Manjushri, the bodhisattva of wisdom and learning was raising the hill which the stupa stands on. He was supposed to leave his hair short but he made it grow long and head lice grew. It is said that the head lice transformed into these monkeys! 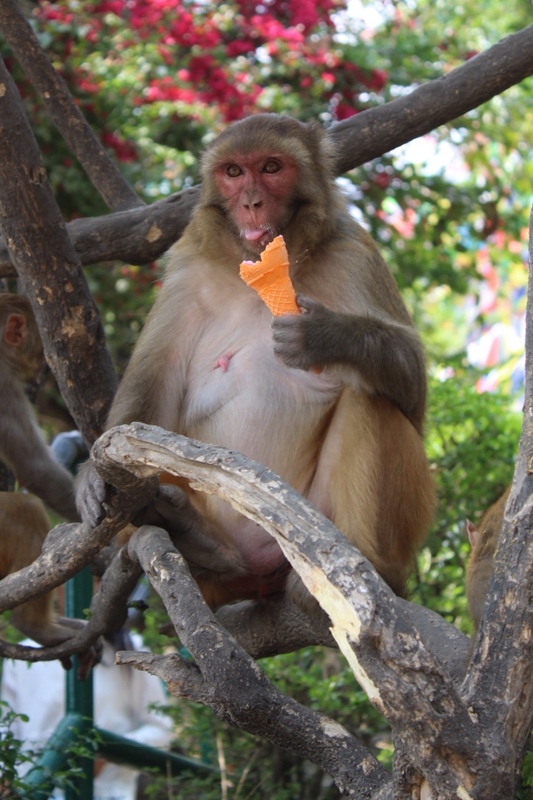 Today these monkeys are hilarious to watch- they jump in the water for fun and steal visitors’ ice cream and popsicles! The Pashupatinath Temple is a famous and sacred Hindu temple complex that is located on the banks of the Bagmati River. The temple serves as the seat of Nepal’s national deity, Lord Pashupatinath. Public cremations are performed river side. 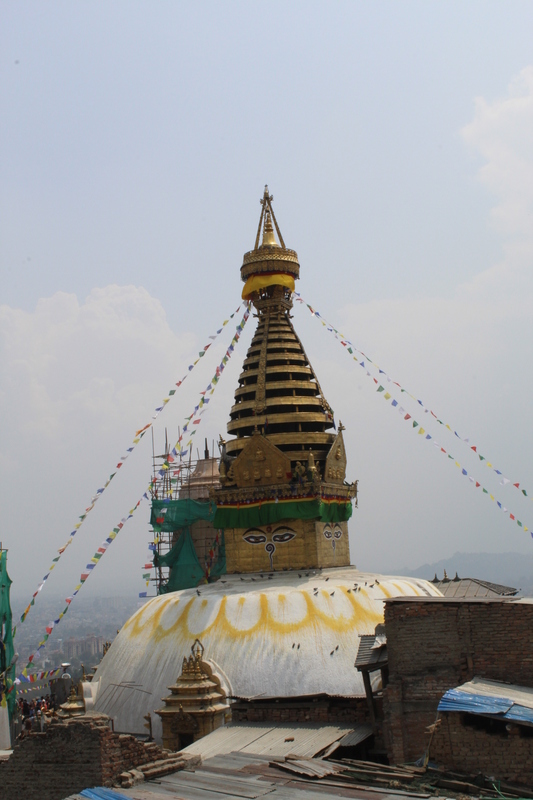 A stupa is a dome shaped structure erected as a Buddhist shrine or place of meditation. Boudhanath stupa dominates the skyline; it is one of the largest stupas in the world. I stayed at the Hotel Moonlight in Thamel- http://www.hotelmoonlight.com. 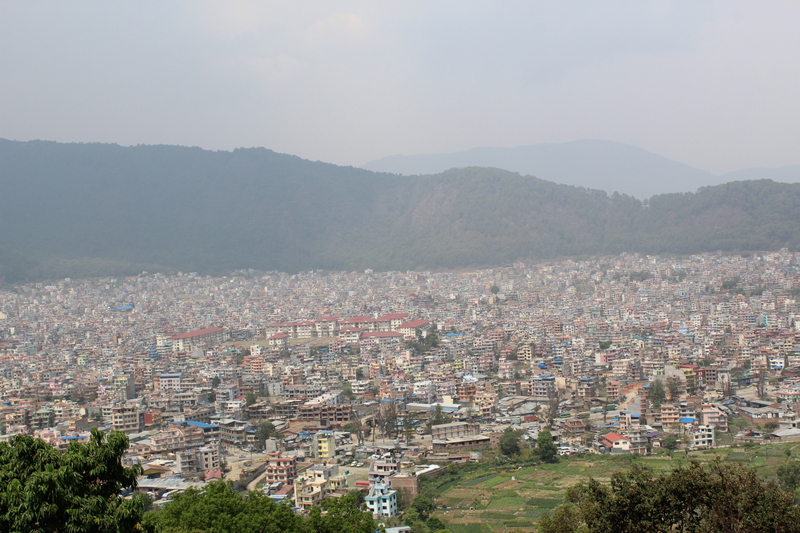 Thamel is a commercial neighborhood in Kathmandu. 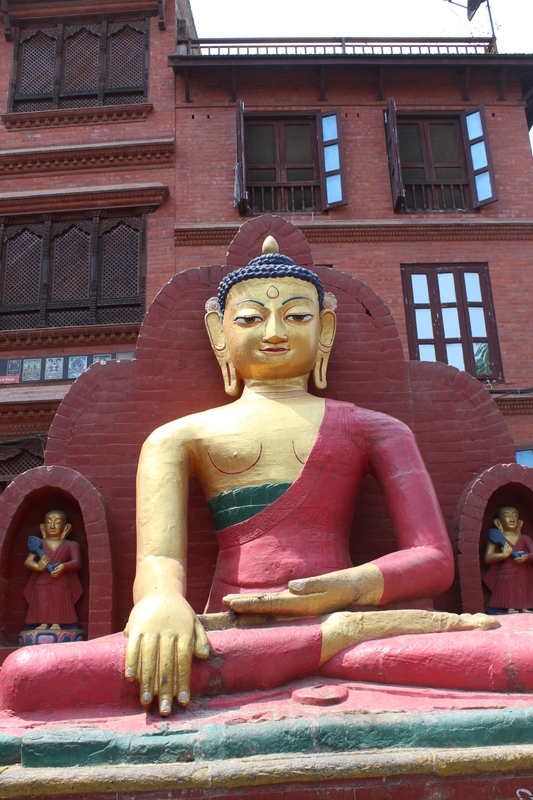 It has been the center of the tourist industry in Kathmandu for over four decades, starting from the hippie days when many artists came to Nepal and spent weeks in Thamel. Even though Thamel has been referred to as a “ghetto” by some, many low-budget travellers consider it a hot-spot for tourism. There are lots of places to buy handicrafts, have a meal, or have a drink. There are plenty of coffee shops and spas also. The next day would be a 6 hour bus ride from Kathmandu to Pokhara to start a 5 day trek in the Annapurna region. Another blog post will be coming soon about my trek with Outfitter Nepal. Amazing adventure. Amazing Andrea! Thanks for sharing. Love you! Be safe. Very Descriptive. Pictures are Colorful. Feels like I was on the journey with you. Awesome!!! Great information. Enjoyed the read and pictures. Great work…I really enjoyed reading this post…very interesting and I’m sure you had a great time in Nepal….would love to see it myself…thanks for taking us there! !